Marston’s Brewery, based in Burton upon Trent in Staffordshire, appointed Kemtile to replace flooring and drainage underneath one of the brewery’s bottling plants. However, it was essential for Kemtile to keep the rest of the brewery operational while these essential works were being carried out. Marston’s Kemtile approached Westgate, as the market leader in designing, supplying and installing temporary dust and building screens which sit between construction and production areas to prevent dust. Two key openings within the production area needed to be sealed. On one opening in particular, the design and installation of the screen was made more complex by a number of conveyors and ducting that were in place, which restricted access for the initial installation. 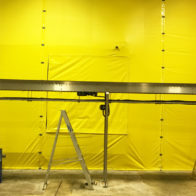 The later stages of the project also required the screen to be versatile enough to be resealed as these penetrations were removed, maintaining the dust tight seal between the two areas. As with all major projects, on occasions access was required for plant and machinery. This was helped by an existing opening in a permanent wall, but the opening also required a dust tight seal when not in use, something that Westgate are used to assisting with. Westgate designed an additional Flexicurtain as part of the overall Flexiscreen solution. This was installed across the opening, with the inclusion of a steel track, enabling the curtain to be opened and closed as necessary. 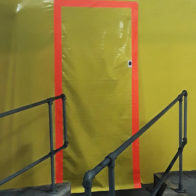 The curtain was fixed and completely sealed down one side, turn staples could then be used in order to hold it completely closed. Westgate also provided emergency exit access panels through both the curtain and screen. Flexicurtain and Flexiscreen with a fire retardant foam infill were the products chosen by Westgate for this particular job. 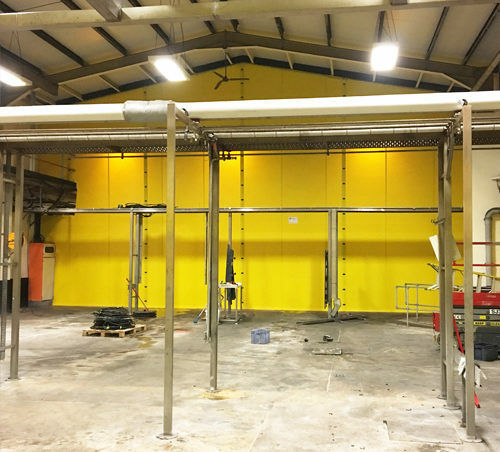 There was an extremely tight timescale to adhere to on this project, with production in the area ceasing only on Friday at 4pm and the screen needing to be fully installed by 8am on Monday. In order to assist with this, the project plan included some initial preparation and installation of one elevation the week before. Everything was in place to allow work to commence the moment the production line was shut down and the conveyors removed. All the work was completed over the course of just one weekend and Marston’s/Kemtile were able to resume work as normal on Monday morning, confident that they could complete essential construction works without sacrificing production time.